Storage Systems garage cabinet systems make it easy for you to put tools, sporting goods, clothing, just about anything in its proper place. It's the perfect way to organize all of your possessions where they are protected and easy to find. You can also secure hazardous materials and yard chemicals away from children. And Storage Systems will free-up valuable floor space giving you more room to work in. These handsome garage cabinet systems are constructed of three-quarter inch melamine or MDF, higher quality materials than industry standards. 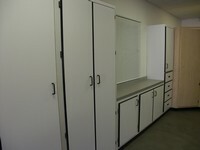 All cabinets are fully finished at the back, so every unit is completely enclosed. Doors are secured with double demountable, heavy-duty brass hinges for added stability. Storage Systems configurations with upper and lower units come with workbench and pegboard as standard features; cupboard units come with adjustable shelving. 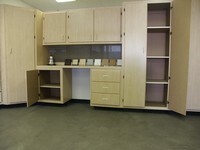 Our versatile cabinets are configured to solve nearly every storage and space problem. Select from one of our popular systems, or have us help you design one that meets your personal needs.